DH awoke around 4:30, got up and started fiddling with his Blackberry. He can’t figure out why it won’t seem to work with the new China SIM card. My Samsung phone seems to work just fine with my new SIM card except I can’t contact DH. After much fiddling and working with the young lady in the Executive Lounge – who made several calls to China Unicom – we concluded there must be a problem with the fact that our phone numbers are Shanghai numbers. The symptom is we can call other people and other people can call us but we can’t call each other – the reason we got the cards in the first place. Much frustration and DH is now prepared to contact the SIM card provider – 3g Solutions on Monday to see if he can straighten things out. To finish this saga, on the way out of the hotel DH stopped at the concierge deck and a nice young fellow took both the phones and after some checking figured out that we had the phone numbers reversed. The one DH thought was for the Blackberry was actually for my Samsung, and visa-versa – mystery solved and everything now works fine. Breakfast was very good in the Lounge and soon we were packed up and off (9:00am) to the Forbidden City – with a million other folks (mostly Chinese). Very overcast day and a bit smoggy out. Kind of a brown haze. At least no more rain! After a stroll down Wangfujing, watching the stores open, we finally made it to Tiananmen Square (which from our vantage point wasn’t all that impressive), and posed for pictures with Mao’s portrait in the background. On the way there, sure enough we got scammed. A “nice” young girl approached us speaking English, asking all sorts of introductory questions, and then came the come-on “Would you go and see some of my paintings and calligraphy – I’m a student studying art – the gallery is just over there”. After a firm “no” from us, she quickly disappeared. 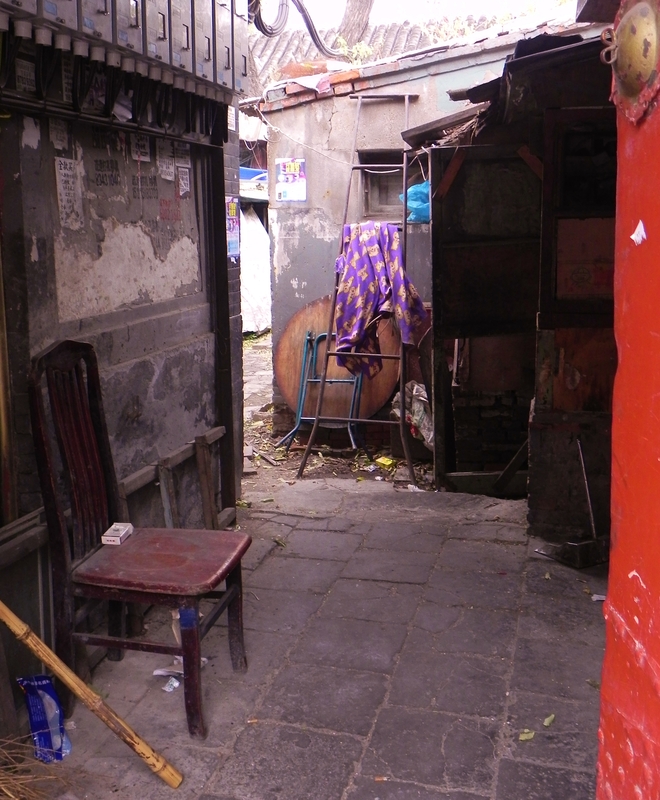 Walked through several Gates until we stopped by our first Chinese toilets. The aroma was intense! DH was finished in no time, but I had to stand in line for a while, the better to enjoy the aroma. “Squatty potties”, but at least there were individual stalls. No toilet paper. Fortunately (and for the rest of the trip) I had brought my own tissues. You dispose of the paper in the trash can (that is usually overflowing), as you are not supposed to put them in the “squatty potty” itself. Then we proceeded to the ticket line. DH sat on some bricks while I got in line, but when I finally make it to the counter I discovered that you needed picture IDs for both people, and of course I didn’t have DH’s. Got out of line, retrieved his Driver’s License and got in line again. DH was still messing with phones. All his Blackberry would do was vibrate, no ringing, so he wouldn’t be able to tell if I was calling him. These phones are time-consuming and frustrating. Onward to the Meridian Gate and finally entering the Forbidden City. The place is truly immense and impressive. And Chinese people everywhere. The outer courtyard was huge with five little marble bridges over canals (called the Golden Water). Once inside the outer courtyard, the large area swallowed up the crowd, and we felt much less overwhelmed. One splendid hall after another, but you really can only see the outside. The few places where you can see inside, there is an insane throng of people pushing and shoving their way to a plexiglass wall that allows you to peek into a very dark interior and catch a glimpse of the royal throne. DH gave up in the midst of the crush, but I was determined to get to the front, and I did for a moment before the throng shoved me aside. I did this only for one of the many throne rooms, but didn’t even attempt it for any of the rest. We got off the central Axis for a while, and there were fewer people here. 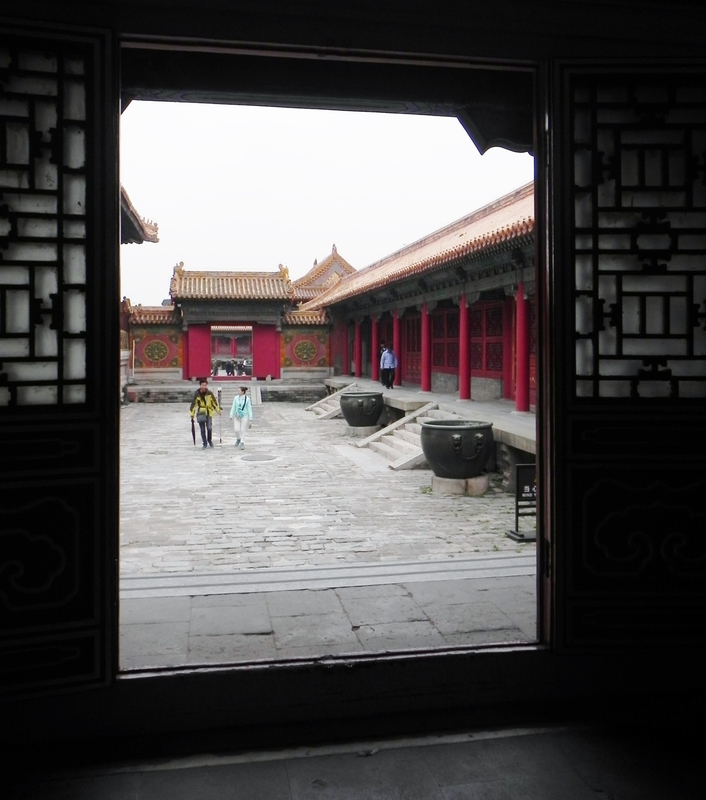 I was fascinated by the red doors with their 9 x 9″ spaced bronze nail-heads in the Eastern Courtyard. 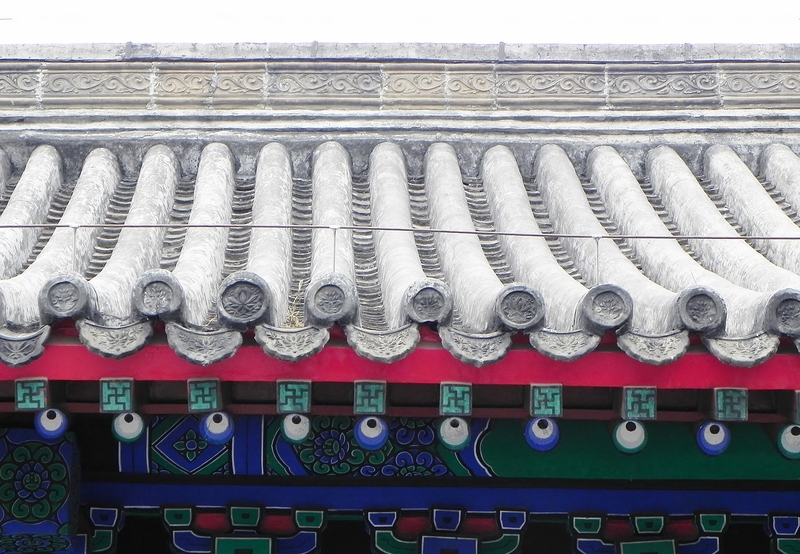 Also equally interesting were the various roof-lines with their guardian animals, all lined up on the corners. The more of them there are, the more important the building. They are supposed to guard against evil spirits and particularly fire. After a couple of hours of walking, we found the entrance to the Treasure Gallery. I left DH sitting on a bench as I ventured further, with a promise to be back in an hour. This is a much less travelled area of the Forbidden City, the scale is much more intimate, with some old cypress trees to break up the massive amount of stone paving. 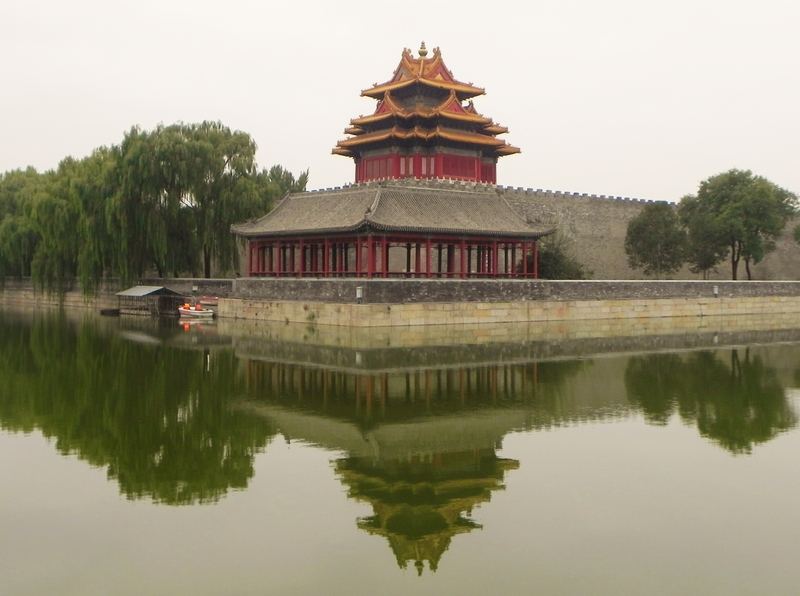 Altogether a more attractive part of the Forbidden City. Some lovely “gardens” though they are mainly made of rock. 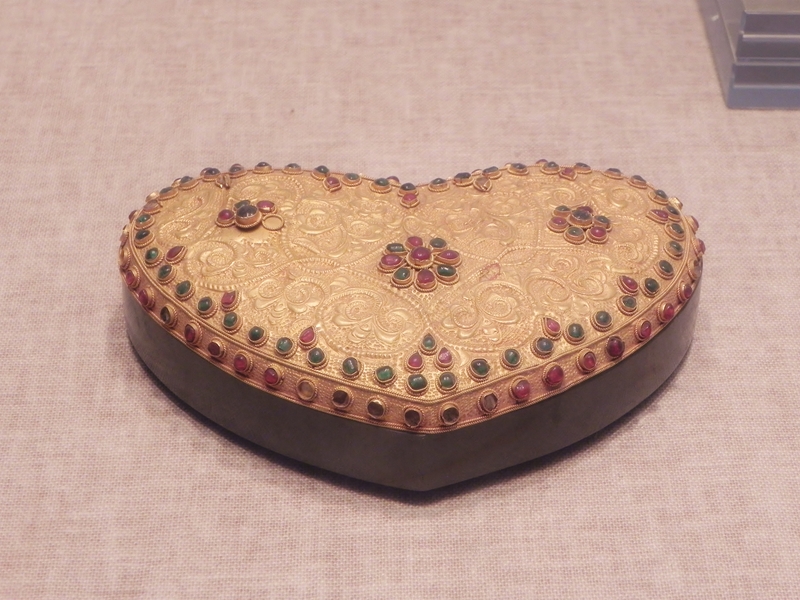 The treasures themselves are in halls that are crowded, and the plexiglass encasing each object looks like it hasn’t been cleaned in years. A few interesting objects, but not that great. 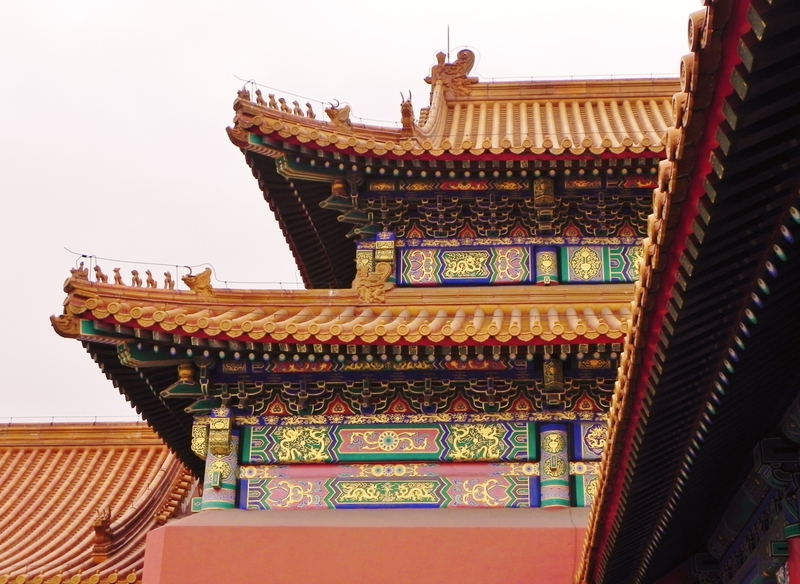 These more interesting buildings and gardens twisted and twinned and finally came out at the far northeast corner of the Forbidden City. By now an hour was up, so I phoned DH, praying the phones would finally work. After one failed call, DH answered, thankfully. I told him I was temporarily lost but would find him. Going against the flow of the Chinese hordes, and not sure where I was going, it took a half hour to get back to DH, sitting patiently. Together again, we joined all the Chinese tourists to find our way out through the Imperial Gardens. 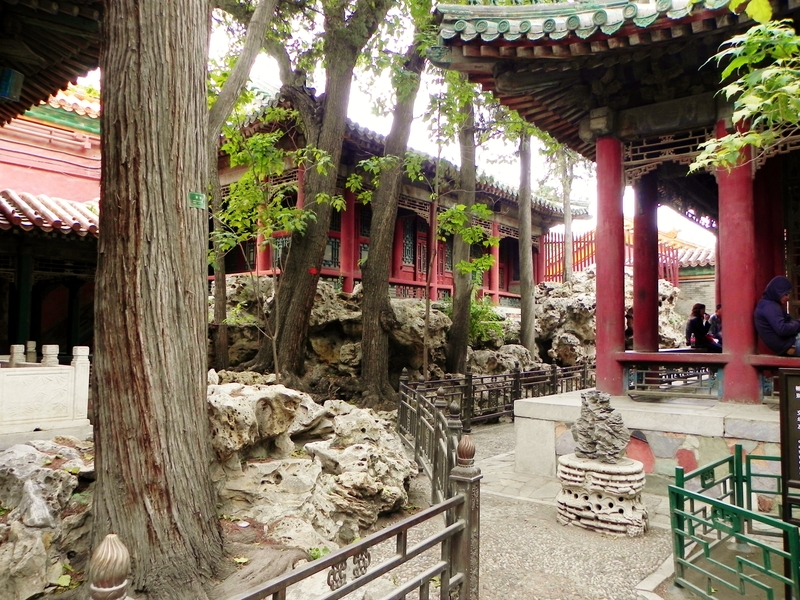 DH enjoyed the Imperial Gardens, with their old cypress trees and craggy rocks. 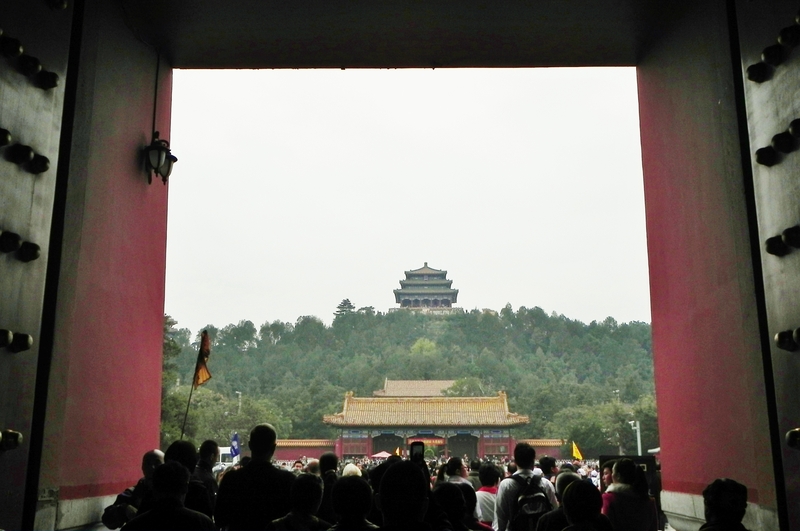 Finally out the back gate, we were inspired by the summit of Jingshan Hill. The Park and its summit were out of the question at this point, although DH was sorely tempted. Then the decision whether to try to get a cab. Most of them were full, and by then we thought we were halfway there. We weren’t! 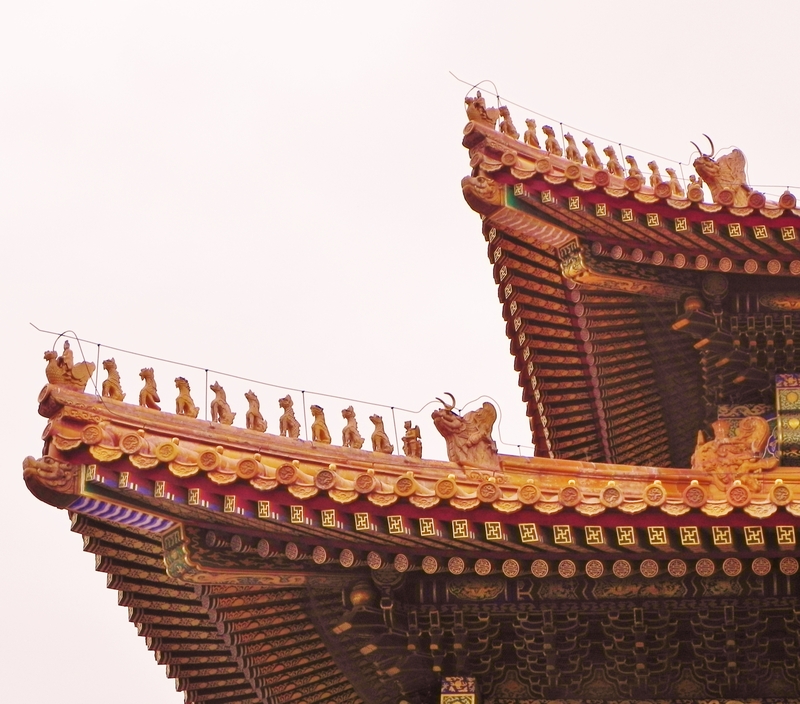 A long, long, long walk back to the hotel, but saw lovely views of the walls and northeast Arrow Tower along the back moat of the Forbidden City, and limped through some interesting hutong areas. We saw St Joseph’s Cathedral along Wangfujing in sharp contrast to the Chinese style temples we had been seeing all day. A short-cut from Wangfujing through the Apple store took us right to the hotel. There were lots of Chinese folks looking at the latest Apple products, and some were buying. And finally back to the comforts of our lovely room. About 3:30pm. DH had a nice long soak in a hot bath. A trip up to the Executive Lounge for a Diet Coke and more water and tea. Ate dinner in the Exec Lounge as well, and then in bed by 7:30pm – exhausted.